The story begins at the Main Factory at Stark Industries where the reformed professor Anton Vanko puts on his Crimson Dynamo armor to test the “light laser.” The laser was about to hit the professor when Tony Stark swoops in to keep Vanko from being hit. Vanko is upset because he is trying to build a useful tool to repay Stark for his kindness to him. Stark tells Vanko that he should consider using more lead coating on his armor. Meanwhile in Moscow Soviet Premier Nikita Khrushchev orders two agents, Black Widow and Boris, to assassinate Stark and Vanko. Plus, if the opportunity arises, they should assassinate Iron Man as well. The pair travel to America as “Madame Natasha” and her brother, a professor from Ukraine. Stark is wowed by Black Widow’s beauty and offers to take her out to dinner, allowing her brother to tour the factory. Boris sneaks past a guard and makes his way to the Restricted Area. Boris sprays solution on the walls of Vanko’s lab to weaken them and uses his super strength to enter. Vanko refuses to help Boris and he uses a “jet paralyzer” to knock out Vanko. Boris places Vanko in a bag and leaves the factory claiming that the contents of the bag are intended for Vanko. Iron Man enters Vanko’s lab and finds the Crimson Dynamo armor engaged. Thinking that Vanko is using it, Boris attacks Iron Man from behind knocking his circuits out. Boris takes Iron Man with him to the agents’ submarine. Iron Man is locked behind a steel door and Boris and the Black Widow return to the factory to take out Tony Stark. Iron Man awakens and uses a lightbulb to recharge his armor. Iron Man finds Vanko imprisoned on the submarine also and the pair bust out destroying part of the steel hull. Returning to the factory Iron Man surprises and knocks Boris down. Boris somehow gets up and knocks Iron Man down in return. 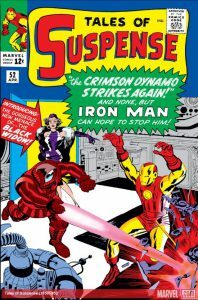 Getting up from the blow, Iron Man shuts down the “laser light.” Black Widow claims she has been struck and calls for Iron Man’s help which allows Boris to strike down the Golden Avenger once again with an electric discharge. Vanko now in control of the “laser light” threatens to shoot Boris with it. Boris believes it is a bluff and Vanko pronounces that America has been good to him and shoots Boris. Unfortunately, the “laser light” back fires and kills both men. In the confusion the Black Widow escapes. Iron Man claims that Vanko sacrificed himself to prove his loyalty to America, and he will not be forgotten. The next day Stark is given information about “Madame Natasha” and her true identity. Stark feels pity for her. In the final scene the Black Widow is seen on the run and filled with the feelings of fear, loneliness, and abandonment. Lee, S., Bernstein, R., Rico, D., Heck, D., & Lieber, L. (2014). Iron Man Epic Collection: The Golden Avenger (Epic Collection: The Invincible Man). New York: Marvel.